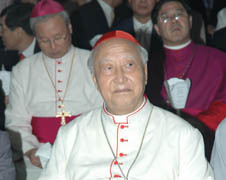 Nicholas Cheong Jin-suk, the Archbishop of Seoul, a member of the College of Cardinals, has been asked to resign by a group of his clergy. Notable that the man is seventy-nine years old, and presumably submitted a resignation four years ago. From that news brief and this one, it seems more difficult to tell if this is about a difference of opinion on the environment or an inaccurate accounting by Cardinal Cheong of the stance of his brother bishops. Notable also that the Korea Herald broke the story as the complaint of “elderly” priests. Some in the picture didn’t look that old to me.